Safety is paramount in rail – and deeply ingrained into the core of the industry’s culture – evidenced in its position as the safest railway in Europe. However, with regards to current rail safety, experts have expressed concern that, in the pursuit of a digital railway, the health and safety of its workforce could be compromised. Arguably, this concern could be attested to the industry’s longstanding reputation of being culturally reluctant to change, particularly as change is often associated with risk. However, the rail industry also has a long and proud tradition of learning from its extensive experiences. As a result, there is growing acceptance that paper-based system are becoming inefficient, specifically in relation to how the industry approaches, manages and mitigates safety and risk. Across the wider transport industry, the somewhat natural alternative to paper-based processes is the smartphone, which bodes the question: does the smartphone have a place in the future of rail safety? While the industry once banned the use of smartphones on worksites – through fear of causing risk or injury to potentially distracted operatives – a clear majority of companies in the industry are now acknowledging the wide-reaching benefits of smartphone technology, especially within the realms of safety, alongside the quality of work that can be achieved through its adoption. At 2017’s Rail Media Rail Safety Summit, a popular topic of discussion focused on increasing levels of communication and collaboration across the industry, to facilitate improvements in the safety of those working on or near the line. While smartphones weren’t directly discussed, the solution – given the long term aims of the rail industry – becomes clear, when considering the disparate nature of the rail industry’s workforce. Indeed, the primary function of the smartphone is communication, which in turn, is the fundamental cornerstone of collaboration. As the industry strives for a more collaborative approach to rail safety, digitising its processes using smartphones offers a clearer view of the workforce, and what is needed to ensure rail safety procedures are being followed and implemented correctly on site. Similarly, from the perspective of rail’s workforce, having core processes available on an app-based platform, makes it far easier to engage with, and adhere to, industry standards and good practices from anywhere in the network. The Office of Rail and Road (ORR) have reported that, despite measures taken by the industry to ensure the health and safety of operatives, there are still significant gaps in rail safety management. During the ‘safety, culture and personal responsibility’ section of the Rail Safety Summit, Ian Prosser, chief inspector of railway and director of railway safety, discussed that, while there has been a strong safety performance in recent years, there are still areas that require vast improvement. Equally, the Rail Office Investigation Branch (RAIB) indicates that the reality of risk assessment planning is not ideal, with reactive risk assessment approaches being implemented more often than predictive. While there is valid argument that indicates both are needed, safe system of work planning and health and safety processes need to be addressed first. Furthermore, RAIB’s reports show that there is a clear mismatch between the reality of safe system of work planning and the Network Rail industry standard. Planners are sometimes never on site, and thus unaware of site conditions in certain areas of work. As a result, what is laid out on the safe system of work plan, does not always align with the realities of working on site. In some cases, it is reported that the COSS often plans safe systems of work, which further negates what is outlined in Network Rail’s standards. Therefore, there is a vocal need for greater collaboration between planners, site safety leaders (safe work leaders) and the COSS. This is addressed in Issue 9 of Network Rail’s 019 Standard, compliance of which is now active throughout the network. Improvement in these areas lies in digitising the paper-intensive processes involved in the planning of works delivery. Doing so will enable a fundamental transformation in how the industry plans work on the railways moving forward. Indeed, the rail industry has taken great strides in recent years, to truly embrace innovation, with more companies now realising the true power of technology and the role it will continue to play in the future. The first step toward a truly digital railway is smartphone adoption. While there is certainly no complacency involved in utilising smartphone and app technology to streamline and digitise processes, there are still gaps in just how it can transform how operatives carry out their work and support the continued improvement of rail safety across the industry. How can smartphone adoption benefit rail safety? The Network Rail 019 Standard update in 2017 outlined the necessary steps companies need to take to be compliant. The obvious solution to what is called for, is a powerful app-based platform that can be distributed directly to the devices of the industry’s workforce. Being able to digitally plan work to be carried out in a single, end to end workflow, is not only quicker and more cost effective than utilising paper-based processes that can take days to complete, it also offers teams the ability to communicate and collaborate more effectively, regardless of where they are in the network. What’s more, having an app-based platform that utilises collaboration tools not only addresses the issues that Ian Prosser raised in his presentation at the Rail Safety Summit, but also streamlines and increases the efficiency of how work is planned on the railways. Digitising workflows and paper-based processes also transforms how data is shared in the industry. Enabling operatives to submit vital documentation, such as close calls, schematics and industry permits digitally, not only establishes a culture of data sharing in rail, but also enables the workforce to become more predictive in mitigating risk. 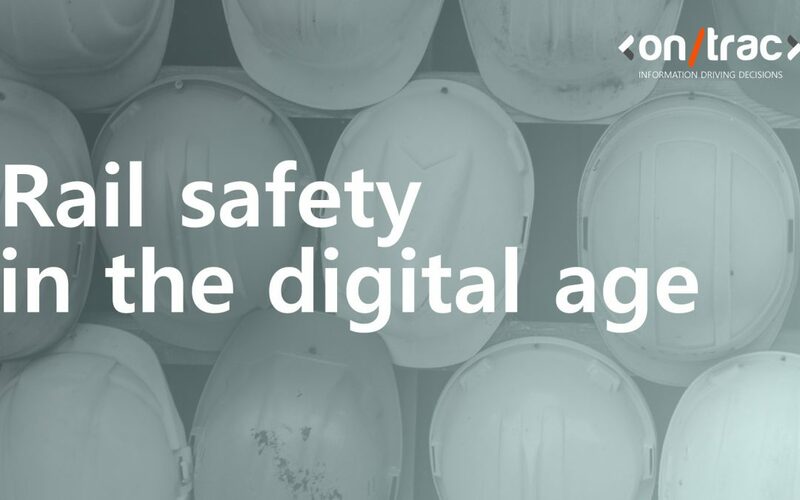 This fundamentally transforms the improvement of the safety landscape, as well as the industry’s further digital engagement in the future. Beyond planning, operative health and rail safety can also be digitised to improve the quality of the industry’s workforce. According to the ORR, hand arm vibration issues are under reported in rail. The most recent annual health and safety report shows that this is a key area that requires further occupational health involvement and improvement across the industry. Over exposre to power tool vibrations is, as a result, a common health and safety hazard, which suggests a mismatch between the reality and principles of good practice reporting in rail. Digitising the management of this would enable operatives to become more aware of the hazards of over-exposure to power tools and allow them to receive guidance and prompts on how long to use these tools for, before causing harm to themselves or others. Equally, fatigue management is an increasing issue that the industry is starting to deal with more rigorously. Network Rail’s Home Safe Plan outlines fatigue management as a priority. However, as reported by the ORR, there is evidence of operatives suffering from reduced mental awareness, impaired concentration and judgement, as a result of sleeping in their cars due to long hours and travelling long distances to get to and from worksites. In a similar process to hand arm vibration management tools, a digital fatigue management tool to monitor levels operative fatigue and enable the implementation of appropriate policies, in line with good practice, would counter-act the growing problems faced by rail operatives. Making this available on a platform that can collate and distribute data to appropriately identify trends and areas of improvement for the wider rail industry to consider and implement, would be incredibly advantageous. This would not only vanquish the concept of fatigue in rail, but increase the attainment of more predictive health and safety management across the rail industry. While there is always work to be done to ensure the continual improvement of workforce health and rail safety, the industry is increasingly active in pursuing technology to support this. The industry now realises the inefficiencies of paper-based processes, alongside the benefits of digital health and safety management far outweighing any cons. Smartphone and tablet adoption empowers the workforce to consider health and safety in a new way, enabling them to take their own safety – as well as the safety of their teams – into their own hands. This not only answers the rail industry’s aims for increased and improved collaboration, it also facilitates the improvement of a valued health and safety culture in rail, as the industry continues its pursuit of a digital railway.